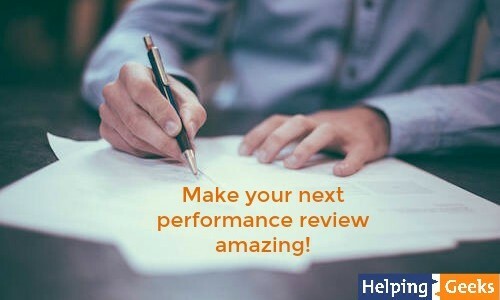 It’s mid year, and about time to think about performance reviews – yours AND people who report to you. In this episode I cover some key ideas about how to reset the goals for the rest of the year, and how to set yourself (and your team members) up for success. Dealing with a disrespectful team member – Sea:2Ep:4 – Learn about the XYZ formula and apply it to your work environment. 33 Minutes To Setting Amazing Goals – workbook to help you set priorities and establish big picture goals for the year. 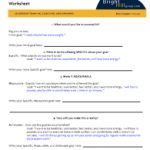 SMART Goals Worksheet – A worksheet to help you define what your goals are and how you can achieve them. The Rainmaker Platform – I love the platform because it handles the technical aspects, and lets me focus on creating great content for you! Announcer: Becoming a Geek Leader. Season Two, Episode Seven. Welcome to the Becoming a Geek Leader podcast. My name is Tom Cooper. As a geek, I’m on a mission to figure out better ways to lead others at work and at home. Through the Becoming a Geek Leader podcast, I’m sharing what I’m learning so I can help make you more effective at leading people, too. Ready? In today’s episode, I want to talk about performance reviews, how you can make sure that you get a great one this year. I’m also gonna go behind the scenes and talk about some of the technology I use to keep the podcast going and to keep you in the loop. And finally I’m gonna share an email from a listener who’s working on an Agile project with a product owner who doesn’t quite understand what Agile means and I’m gonna offer some tips on how to deal with him. Let’s get started. Tom: Can you believe it is the middle of summer already? It’s time to talk about performance reviews. I was just talking with a client the other day and she said, “Well, I haven’t heard anything from HR about mid-year reviews, so I really don’t have anything to do about that.” Wow. Really? Now I’ve been on the receiving end of a bunch of reviews over the course of my career and some of ’em were good and some were downright awful. And I know that they can be a big problem when it comes to employee engagement. There are two ways that a well-meaning boss can really deflate us as employees on our review. First is a review that only points out bad things we’ve done that doesn’t pay any attention to any of the good things we did. And the second is a review that praises us for things that we thought were minor but overlooks the big stuff. Now both of these are definitely problems and even those two don’t account for reviews where we get blamed for things we didn’t do or we get evaluated for stuff that was never on our goal list, for heaven’s sakes. Now that’s somebody who really was passionate about getting reviews and getting ’em done well. And your boss is busy. He’s got too much stuff to do and you wanna make sure that you’re working on the right stuff so you get good work done and so you can have a great review when it comes to the end of the year. And your boss is in the same boat you’re in,. You’re busy and overwhelmed. So how can we make it easier for our boss and help improve our own performance at the same time? If you’re a team member, this is a skill you can start to use at level one of the four levels of thinking as a geek leader. At level one, you may even be a superstar technical resource. Level one focuses you on improving your technical skills. Tom: I was raised in a family of political junkies. We loved to listen to debates and speeches and I remember watching C-SPAN and I liked to hear the leaders in their own words without spin doctors telling me what to think. And my family spent time discussing and arguing our positions and I think most of us probably enjoyed it. And back before podcasts were popular, one of the ways I kept my mind engaged while working on home repairs or when I was running errands on a Saturday was I liked to listen to C-SPAN Radio. On Saturdays, they’d play Supreme Court oral arguments and they also played presidential tapes, recordings made by the president of whatever was going on at that time. It was on one of these Saturday afternoon listening sessions that I learned an important lesson about how to get a busy boss to make progress on something that you care about. The recording was from March 8th, 1965, and President Johnson was talking to his press secretary, George Reedy, about presidential appointments. Now what I noticed was the president was reading out loud a letter which finished with the words, “We have drafted a letter asking Donner to accept, which will be prepared for your signature.” I think I’ve got an audio clip here. President Johnson: Donner’s term as a member of the Board of Communication will expire. He’s one of your original appointees [inaudible 00:06:10] which coincides with the expiration of his term May 11th. We have drafted a letter asking Donner to accept, which will be prepared for your signature. Tom: I cannot think of a job that’s more busy than the President of United States. His team had helped him by making a recommendation for him. They saved him the time and the work of personally reviewing the list of people who could possibly be appointed. And not only that, but they had drafted a letter and prepared it for his signature. Now he’s the President. Of course he had the power to change the plan, but if he wanted to move forward with the recommendation of his team, all he had to do was sign the letter. It made it simple for him. So let’s get back to our question. How can you make it easier for your boss and improve your performance at the same time? You can do what President Johnson’s team did. You can make it easier for your boss. 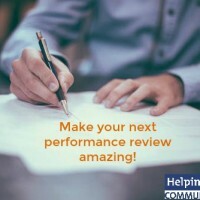 One challenge we have with performance reviews is that in most organizations, nobody and I mean nobody is thinking about performance reviews at all. Unless we’re getting close to a deadline or maybe we’ve blown completely past the deadline. And we could have another separate conversation from this podcast about the value of annual reviews and whether they work or don’t work and how some companies are experimenting with eliminating them, but that’s a topic for another day. I think eventually companies are gonna come back to using performance reviews because I think they perform an important function but again that’s a separate topic for a different day. In general, any time you can make your boss’s life easier, that’s gonna be a big win for you and for your boss. If you’re able to deliver great work product that your boss can forward to his boss, that’s something that is always gonna make your boss smile. If you’re gonna be able to deliver great work product that your boss can forward to his boss, that is something that will always make your boss smile. I said it twice because it’s important. Anything you can do to make your boss’s life easier is definitely gonna play well for you. Philosophically I believe every single team member ought to be looking for ways to become better at their job and then after they’ve demonstrated their proficiency in that area, they should look for things that their boss is doing and start learning how to do ’em for your boss. Now I wanna just put this right out there for you. I think once you’ve demonstrated that you are competent in the work that you’re assigned to do, you should stretch and try and look at things that your boss is doing and find ways to take those things off of your boss’s plate. So how does that relate to your performance review? It’s simple. Do you think your boss wants to spend a ton of time coming up with goals, measurements, and assessments of how well you did? Probably not. And realistically there are other people on the team besides you and that’s just one more thing on the pile of things that your boss has to do. And I promise that is not on the top of the list of fun things for him to do or for her to do. So what can you do? You can write your own goals and measurements. Now I’m not saying that you sandbag or you say, “I am the best person ever.” I’m not saying that at all. But how do we go wrong? Well, what usually happens is that at the beginning of the year, we have some…at least a vague idea of the things that we need to do. But for most of us, over the course of the year, some of those things are going to change. And by the time we get to annual review time, we worked on this goal for a while and we worked on that goal for a while, then we had a new goal we worked on for a while…it’s no wonder we’re confused. What I want to encourage you to think about is, how can you break it down into smaller pieces? If you can show progress toward goals, you’ll have a lot more clarity about whether you’re working on the stuff your boss wants you to work on, as long as you continue to think in short time-frames. So for example, let’s say that at the beginning of the year, your boss told you there were three big goals. Goal one: launch a new version of product XYZ before December. Goal number two: reduce developer time spent on operational support by 20%. And goal number three: stop wasting developer time on sales demos. Equip the sales team with documents and demo tools so we don’t have to spend developer time with sales. So now let’s say that it’s summer. It’s halfway through the year. You’ve been working on these three big goals since the beginning of the year. But if your boss asked you right now how much had you gotten done, I mean, you could talk about the tasks but you might be struggling to give, I don’t know, a percent complete or to give him a sense of how much you’d actually gotten done. So how do you move forward from here? Well, the first thing I would encourage you to do is check with your boss to make sure that those goals are still the highest priorities that are relevant. In some cases, what your organization had hoped to do this year, it just didn’t work out and priorities got shifted. And sometimes there’s an urgent thing that came up and sometimes, too, nobody told you about the shift in priorities. Having a conversation with the boss is a great way to get started to think about making sure you’re working on the right priorities. Next, look at just one of the goals on the list. And I want you to think about, if you were making progress, how would you know? How would you know you’re making progress? Now what is one way over the next month or two you could demonstrate progress toward that goal? When you think about demonstrating progress, is it easy to prove? Is there an easier way to show progress? The thing is, the harder it is for you to collect the information and report your progress, the harder it’s gonna be for you to get your review done well. And I want you to think in terms of what is the smallest unit of work that you can easily count and show progress toward the goal? We’re talking about baby steps. How can you demonstrate progress? Now it’s important to think about demonstrating progress in a way that others perceive as actual progress. So let’s talk about that first goal that was on the list: launch a new version of the product. Now when you think about defining those goals, sometimes it’s helpful to have a model to look at and I’ve got an e-book that I’ll put a link to in the show notes. It’s called “33 Minutes to Amazing Goals” and in the show notes, I’ll also include a copy of my SMART Goal Setting Worksheet, which I think’ll be helpful for you as you start to think through those goals and those measurements. Now it’s pretty simple after that. After you’ve identified one baby step, you’re gonna wanna move on to two more and you’re gonna identify deadlines for each of those as well. The more work you do to identify what needs to happen and how you’re gonna measure that and making it easy to do those measurements, that’s gonna make it that much easier for you and your boss to be on the same page about what exactly you need to work on, getting those priorities set. And not only that, but as you begin to collect those metrics and check off those baby steps as being done, it makes it even easier for your boss to give you credit for the work you’re accomplishing. What we’re talking about here is how to make it easy for others to get things done. The more prep work you do, the easier you make it for your boss. The easier you make it for your boss, the better it’s gonna be for you and your performance review is just one example of where you can perform like an advisor to the President of United States, by making it easier for your boss and that today’s Mentoring segment. Tom: You know, it’s funny, I was preparing to record this episode and one of the segments in today’s episode is a Behind the Scenes segment and I’ve got some content I definitely wanna share with you but I also have to laugh a little bit and say this is my second attempt at recording this episode. I realized as I was recording, I noticed that things were recording, but when I went back to check one of my recordings, it had been picking up my voice through the wrong microphone. And since I know that audio quality is important, this is my second attempt at recording this episode. Hopefully now it’s actually recording using the correct microphone. It’s hard to believe as I’m recording this that it’s late July. And this summer, I’ve been thinking a lot about things that are behind the scenes in the business. Today I want to talk about my website and how I communicate with you. I started the business about five years ago and when I first got started, I knew I needed a website and I wanted to get something up and running pretty quickly and so I used a tool called Google Sites and that site was…well, let’s just say it was ready to be replaced probably the day that I launched it. Not very long after that, I hired somebody to help me do design and layout for a custom WordPress site. And I found a hosting provider that was a pretty good hosting provider. They had a lot of geeky options that made me feel comfortable that I could do backups and I could test things and I’d keep the site up and running and I felt pretty good about that. But keeping the website alive meant that every time there was a new release of WordPress, I had to spend time fiddling around and testing to make sure the plugins and custom themes were working properly. And it didn’t take me very long to recognize that I’d become a part-time website administrator and that the time I was spending on administering my website was time I really could have been spending working on helping clients and helping you and thinking deeply about what does it mean to move from being a geek to being a leader? And I decided something had to change. I was pleased to discover a tool called the Rainmaker Platform. It’s an all-in-one service and it’s really kind of neat because it allows me to have a mobile responsive website, which my old site didn’t have, and give me a platform for publishing my podcasts and blog posts and gives me a place to share documents and manage my social media postings and it gives me an up-to-date security-managed website with a complete learning management system so I can offer online classes and it takes care of payment and a thousand other things for me so I can focus on the stuff that I love to do, which is about leadership and influence and helping you become a geek leader. Even though I’ve got a background in computer science and actually I’ve been working with one of my boys recently to figure out how to do some Google script to do some manipulation of some code and teach him a little bit about coding, coding is not what I want to be investing my time in right now and moving to Rainmaker let me move away from some of that more technical stuff so I could focus on the things I wanted to work on. In case you’re curious about it, I’ll include a link to the Rainmaker in the show notes for this episode as well. Now this last week or two, I’ve been experimenting with a new feature that they’ve offered, email marketing. I’m still doing some testing, but I think there’s a pretty good chance that I’m gonna be migrating away from AWeber’s email service. I’m not entirely unhappy with AWeber…I’ve been using them for several years now…but keeping track of people in multiple systems, it’s just not ideal and by having it all under the one platform I think is gonna be helpful. Now it’s not as simple as it might seem. Yeah, I can export my mail list and content and import it over to the Rainmaker side, but I also have some automated email sequences that get sent out using AWeber today, so I’m probably gonna need to recreate those in the new system and then while I’m at it, I’m probably gonna want to refresh them because some of those sequences have been around for a long time and they may not be relevant. One of my goals is to think through the user experience. How can I do a better job of meeting your needs and giving you useful and helpful information? As I’m learning, I’m investing time in thinking about the latest tools and the best approaches for communicating and then I work to make my downloadable resources as valuable as I can for you. And what that means is I’m learning things and I look back on what I’ve done in the past and I realize I could’ve done it better. And many times, that means that I’m editing or recreating resources to make ’em better for you. I also take seriously intellectual property and over the last several years, I’ve had a bunch of opportunity to learn about licensing for video clips and music and photos. And I’ve learned that there are a number of places to find good quality images that I can use as long as I provide attribution to the author at no charge. And there are also a number of sites that offer images and music and movies that are in the Creative Commons zero license. Now that license doesn’t require attribution at all. And then there are licensing sites where you can pay for access to images and music and movies. And the images that you see in my products, they come from a variety of sources and I’m careful to make sure that I’ve got a license that covers the way I use the image. Because sometimes the license requires, if it’s a special license for, if it’s in an electronic presentation or maybe if it’s in printed materials or if it’s online. It turns out licensing intellectual property can be pretty complex. That’s one more thing I didn’t realize I’d be learning as I went down this journey. And that today’s Behind the Scenes segment. Well, Fred, the first thing I’ll tell you is that whatever you’re doing, that’s not Agile. It’s not even Waterfall. What you’re doing is kind of messy. To make progress here, you’re gonna have to work with your product owner and this is a skill set that you’re gonna be wanting to work at when you’re at level two of the four levels of thinking as a geek leader. Level Two is where you work well with others and together you all succeed. Tom: How are you gonna get your product owner to stop changing direction every two weeks? Just like Jack Ryan, you have to ask, “How do I get the product owner to want to be more consistent?” Now in Jack Ryan’s case, as I’m sure you recall, the sailors were convinced they were gonna die from radiation poisoning if they stayed on the boat, so they really wanted to get off and I’m not suggesting you threaten anybody’s life. But how can you get them to want to change? They’ve got to want to change. I like to tell people, “If you don’t have a plan about where you’re going, then whatever direction you’re headed right now, that’ll be just fine.” Right now it sounds like you’re changing your destination on your road trip every couple of weeks and that’s not good. With that kind of planning, it sounds like your development project’s a little bit like the Israelites from the Old Testament in the Bible. You’re wandering in the desert and if you don’t watch out, this software project may take you 40 years to finish. But seriously I think that you and your internal client have got to get on the same page. Again, what they’re doing is definitely not Agile, even if they’re using those terms and even the titles like product owner. How do you get the product owner to want to be more consistent? As I’m going through this next section, if you listen carefully, you’re gonna hear me using the XYZ formula. In situation X, when you did Y, it had Z impact. And I talk about this approach in detail in Season Two, Episode Four, Dealing With a Disrespectful Team Member, and I’ll have a link to that episode in today’s show notes. If I were in your shoes, I think I’d want to approach the product owner and say something like this: “Hey, my goal is to develop as many new features and bug fixes as fast as possible. Would that be okay with you?” Now I can’t imagine that they’re gonna say no to that question. Who doesn’t want as many features as fast as possible? You can go on and say, “If it meant we needed to adjust our process a little bit to give you those faster features, is that something you might be open to talking about?” And again, I don’t think you’re likely to get a negative response here. They might be a little guarded or a little bit hesitant, but you’re in the zone now to be able to offer some feedback. And the way that I start that conversation is by asking the question: “May I offer you some feedback?” Now almost never will they say no or almost 100% of the time, they’re gonna say yes to this request. So once they say yes, you use the XYZ. “Last week, when we stopped that sprint right in the middle, the team was pretty frustrated. We thought we were all on the same page about the sprint goals, but then all of a sudden, we had different goals we needed to work on and we had to start all over. We felt like we lost a week of development completely and that put us behind and slowed us down in getting you those new features you asked us to deliver. You’re probably gonna get a positive response to this, but I’m not foolish enough to believe that magically all the issues you’re describing are gonna go away. In fact, I would suggest, based on what you’ve told me, that it’s probably wise to have an Agile coach come in and work with the whole team. Not just send people to Agile training, but actually have somebody come in and work with your team because if this is a new methodology for you personally and it sounds like real Agile would be a pretty big culture shock for your product owner, it would probably be a good idea to have somebody who can come in and help you get the processes set up and get the tools in place to really move things forward. But you’re gonna need to connect as a team and get focused on those same goals. And I would invest whatever time it takes to get alignment because without that alignment, your client is gonna burn the team out and he’s not gonna get what he wants and then everybody’s gonna be frustrated. Working toward a common goal can help make sure that your time is spent well. And that’s today’s Coach’s Mailbox. Tom: In today’s episode, we talked about some behind the scenes tech, how I host the podcast on my website using the Rainmaker platform. We also talked about how to get your product owner to wanna work with you instead of changing direction all the time. And finally we talked about how to help your boss and help yourself get better performance reviews. In the Episode Hack today, I want you to think about a goal you’re working on this year. What is one baby step you can take to move you in the direction of getting things done? Now make sure that that is a step that others are going to see as progress. If you want some help thinking that through, check out my e-book on the podcast webpage right in the show notes there. You can find the e-book, this is Season Two, Episode Seven and right there in the show notes page, you can get free copies of the e-book and my Goal Setting Worksheet as well. So what is that baby step? And that today’s Episode Hack. Hey, can I ask you something? Did you hear something helpful on today’s episode? Why not share with a friend? On my iPhone, it’s as simple as hitting the three little dots on the bottom right of the screen, selecting Share Episode, enter your friend’s e-mail, and hit Send. Why do this? Two reasons. One: your friend or coworker will thank you, you’ll be seen as a source of helpful and valuable information, and they will appreciate you for it. And number two: I need you to help me get the word out about this podcast. I’m working hard to bring great ideas and great content to you and it’s a big help to me if more people hear those ideas. Go ahead. Share it now. I’ll wait. Thanks. This is Tom Cooper. Thanks for listening. Be sure to join me next time for another episode of Becoming a Geek Leader. Join me in my mission of discovering better ways to lead others at work and at home.